Bell’s palsy is one of the primary causes of facial paralysis in the United States. Yet large-scale clinical trials offer limited conclusive evidence about the effectiveness of corticosteroid and antiviral therapies to treat Bell’s palsy patients. Comparatively, randomized, controlled studies have shown that early administration of corticosteroids helps improve a Bell’s palsy patient’s chances of making a full recovery. Corticosteroids reduce edema, improve cranial nerve VII regeneration and enhance motor function. By offering corticosteroids within the first 72 hours of Bell’s palsy onset, patients can alleviate their facial paralysis symptoms. Antiviral therapy is sometimes used in Bell’s palsy cases in which the underlying facial paralysis occurs due to HSV-1. However, no controlled study has delivered sufficient clinical evidence that shows antiviral therapy is an effective Bell’s palsy treatment. Can a Combination of Corticosteroid and Antiviral Therapies Be Used to Treat Bell’s Palsy Patients? In some instances, both corticosteroid and antiviral therapies are used to address Bell’s palsy symptoms. In one study of 124 Bell’s palsy patients, some participants received daily acyclovir and prednisolone treatments, and others received only acyclovir or prednisolone. Among Bell’s palsy patients who received both corticosteroid and antiviral therapies, 79.7% achieved full facial function recovery after three months, and 92.7% achieved full facial function recovery after nine months. For patients who received only acyclovir, 71.2% achieved full function recovery after three months. And among patients who received only prednisolone, 94.4% improved the chances of full facial function recovery at three and nine months. Isolated studies indicate acupuncture and physical therapy sometimes help individuals address Bell’s palsy symptoms. But the clinical benefits of these treatments require further investigation. For Bell’s palsy patients dealing with acute facial paralysis associated with temporal bone fractures, electroneurography and electromyography studies have been used to examine the effectiveness of surgical nerve VII decompression. These studies revealed surgical nerve VII decompression can be effective to treat Bell’s palsy symptoms. Yet most neuro-otologists indicate that surgical intervention should be administered within two weeks of an acute facial paralysis diagnosis. For FNP patients, a gold weight may be implanted onto the upper eyelid tarsal plate to protect the cornea Additionally, horizontal lid shortening or other procedures may be performed in conjunction with gold weight placement. Tarsorrhaphy may be used to treat and prevent corneal exposure. This procedure can be customized to a patient. Facial nerve grafting is used for partial resection of cranial nerve VII due to trauma or tumor. Meanwhile, hypoglossal–facial nerve transfer is commonly used to treat patients with complete FNP that is less than 18 months in duration. Static suspension helps FNP patients improve oral incompetence and restore facial symmetry at rest. Also, temporalis muscle transfer helps FNP patients suspend their oral commissure. 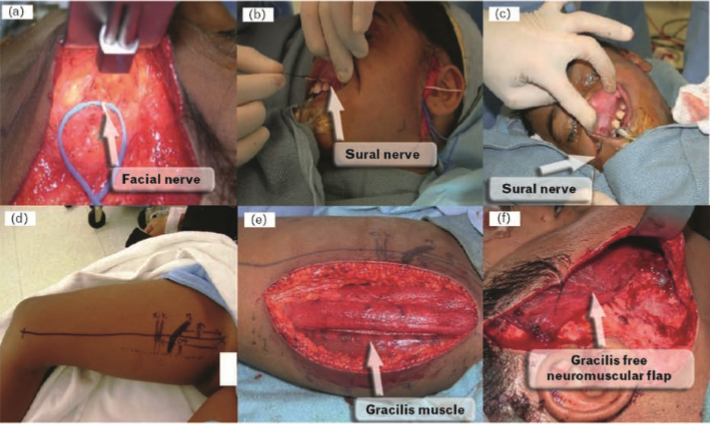 Two-stage cross-facial nerve graft involves the use of a gracilis-free neuromuscular flap powered by the contralateral facial nerve. Or, if a permanent lateral tarsorrhaphy is required, then an FNP patient’s eyelid margins can be incised. A medial tarsorrhaphy also may be performed based on the corneal coverage required by an FNP patient. 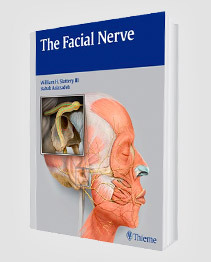 To review the results of recently published studies on the medical management of Bell’s palsy and highlight strategies in the surgical management of facial nerve palsy. Although corticosteroid and antiviral therapy have been proposed for the treatment of Bell’s palsy for many years, the clinical efficacy of these treatments has been debated in Professor, Departments of Ophthalmology and the literature due to the lack of conclusive evidence from large-scale clinical trials. However, recently completed randomized, controlled studies have found that the early administration of corticosteroids improves the chances of full recovery in patients with Bell’s palsy. But there remains insufficient evidence supporting the routine use of antiviral medications in the treatment of Bell’s palsy. In addition, improvement in surgical Current Opinion in Ophthalmology 2009, techniques has allowed the introduction of a number of surgical procedures for patients with permanent facial nerve palsy. 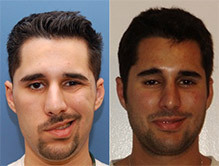 On the basis of the results of several recently completed randomized, controlled studies, corticosteroid therapy has proven to be efficacious in the treatment of Bell’s palsy and should be offered to patients presenting within 72 hours of symptom onset with consideration to the addition of antiviral therapy for severe cases. Surgical procedures can minimize the complications associated with permanent facial nerve palsy. Facial nerve palsy (FNP) describes the condition in which there is damage to cranial nerve VII, resulting in sensorimotor deflcits involving the muscles of the face and ocular adnexa. Cranial nerve VII consists of numerous individual nerve flbers that innervate muscles of the face, periorbita (orbicularis oculi), and inner ear (stapedius muscle) . Cranial nerve VII originates in the pons at the floor of the fourth ventricle and enters the temporal bone through the internal auditory canal (Fig. 1) . The nerve takes a circuitous route in the temporal bone and, upon exiting from the stylomastoid foramen, enters the parotid gland. At the parotid gland, it has a variable pathway but typically divides into an upper and lower division, ultimately forming a parotid plexus and splitting into flve motor branches . Conditions targeting any structures along the route of cranial nerve VII or the nerve itself from the brainstem through and out of the skull base may compromise function resulting in speciflc clinical manifestations [1–5]. A lesion of the supranuclear corticobulbar pathway (central cranial nerve VII palsy) results in a contralateral lower facial paresis with intact upper facial function (including blink). In comparison, a lesion of the peripheral cranial nerve VII affects the upper(blink) and lower muscles of facial expression [4,5]. In general, an insult to a peripheral nerve can result in aberrant regeneration leading to reinnervation of adjacent structures supplied by other nerves or different branches of the same nerve . In particular, aberrant regeneration of cranial nerve VII can result in facial synkinesis in approximately 10% of Bell’s palsy cases . Oral or ocular synkinesis can make communication difflcult and lead to copious lacrimation during eating(crocodile tears)[6,8,9]. FNP can be caused by a variety of conditions including temporal bone fracture, head and neck tumors, and infections [10–15]. The following section will focus on the current literature on the medical management of idiopathic facial paralysis that is commonly referred to as Bell’s palsy. Bell’s palsy is the most common cause of FNP, composing nearly two-thirds of all cases. Bell’s palsy is typically a self-limited disorder and is felt to be the result of a viral-induced inflammation of the nerve sheath . The incidence of Bell’s palsy ranges from 10 to 40 cases per 100,000 with the highest rate occurring in individuals between 15 and 45 years of age [10–12,17,18]. Familial cases of cranial nerve VII palsy have been reported [16,19]. The recurrence rate of Bell’s palsy has been recorded as high as 10% with women carrying a higher risk . Although 70% of untreated patients recover completely within 6 months , as many as 30% of patients may suffer from permanent facial dysfunction . The severity and progression of Bell’s palsy is best categorized with the House–Brackmann Score (HBS) and is often the outcome metric chosen to report therapeutic efflcacy in clinical trials [22,23]. Because of the absence of large, randomized, controlled studies, a consensus regarding the best treatment regimen for Bell’s palsy has been unclear for some time. Two Cochrane reviews [24,25] published in 2004 examined the use of corticosteroids and antivirals in the treatment of Bell’s palsy. Salinas et al. reviewed four clinical trials (totaling 179 patients) published between 1966 and 2005 studying corticosteroid therapy. Allen and Dunn  reviewed three clinical trials (totaling 246 patients) published between 1966 and 2003, studying the role of antiviral therapy in Bell’s palsy. These two Cochrane reviews concluded that the beneflt of medical therapy in Bell’s palsy could not be determined because of the lack of randomized clinical trials and the low number of cumulative enrolled patients in the studies analyzed . However, since the publication of the 2004, these two Cochrane reviews, six large-scale studies [14,22,26,27– 29] – some of which were randomized, double-blinded, and placebo-controlled – have provided an enormous amount of positive data on the role of corticosteroid therapy in Bell’s palsy but the issue of antiviral therapy still remains unresolved. Corticosteroids have been recommended as a treatment for Bell’s palsy due to their effects on reducing edema, enhancing cranial nerve VII regeneration, and improving motor function [30,31]. Despite the fact that a Cochrane meta-analysis  concluded that there was insufflcient evidence supporting the use of corticosteroids in the treatment of Bell’s palsy, the results of six recently completed studies [14,22,26,27–29] following the publication of the review have provided substantial data supporting the use of corticosteroid therapy. (4) placebo for 10 days. Randomization and initiation of treatment occurred within 72h of symptom onset and outcomes were measured with the HBS.Of the patients who received prednisolone alone (n=251), 83% (n=205) demonstrated complete recovery at 3 months (P<0.001) and 94.4% (n=237) exhibited complete recovery at 9 months (P<0.001). In the patients receiving double placebo (n=141), only 64.7% (n=91) demonstrated complete recovery after 3 months and 85.2% (n=120) demonstrated complete recovery after 9 months. The study also suggested that antiviral therapy did not signiflcantly affect the flnal functional outcome (see below). Six months after initiation of therapy, the prednisolone/ placebo group had a signiflcantly shorter time to complete facial function recovery when compared with the placebo/placebo group. At 6 months, complete recovery was achieved in 71% (n=150) of the prednisolone/placebo group, 58% (n=120) of the valacyclovir/placebo group, 72% (n=149) of the prednisolone/valacyclovir group (P<0.003), and 62% (n=127) of the placebo/ placebo group. (2) prednisolone (60mg daily for 5 days with a 5-day taper) and valacyclovir (1000mg/day) for 5 days (n=114). At 6 months, 89.7% (n=96) of patients in the prednisolone/placebo group achieved complete facial function recovery in comparison with 96.5% (n=110) of those in the prednisolone/valacyclovir group (P<0.05) . On average, the patients in this study had more severe facial palsy (HBS 4–5) than those included in the Sullivan et al. study (mean HBS score 3.6). This difference has been speculated to be the reason for the apparent effectiveness of prednisolone with valacyclovir in the Hato et al. study and not the Sullivan et al. study . (2) prednisolone (20mg three times daily for 5 days with a 5-day taper) and valacyclovir (1000mg/day) for 5 days. Of the 66 patients in the prednisolone alone group, the mean time for complete recovery was 70.7 days as compared with 76.4 days in the prednisolone/valacyclovir group (n=84). This difference did not achieve statistical signiflcance (P=0.977). The study found a statistically signiflcant difference in the cumulative recovery rate based on the initial examination severity of Bell’s palsy. (2) prednisone (1mg/kg body weight for 4 days with an 8-day taper) and famcyclovir (750mg/day) for 7 days (n=50). Three months after initiation of therapy, 12% (n=8) of the prednisone alone group exhibited at least a four-grade HBS improvement as compared with 28% (n=14) of prednisone/famcyclovir group (P=0.028). Interestingly, herpes simplex virus-1 (HSV-1) antibody status was not found to correlate with recovery of facial function . (2) acyclovir (2400mg/day) for 5 days and 1mg/kg/day of prednisone (maximum of 80mg/day) for 4 days followed by a 6-day taper (n=47). At 6 months, 85.1% (n=40) of the prednisolone group demonstrated complete recovery as compared with 93.1% (n=41) of the acyclovir/prednisone group . The results were not statistically signiflcant. Current evidence suggests that the underlying cause of most cases of Bell’s palsy is due to HSV-1 and thus the rationale for using antiviral therapy [32–34]. To date, no controlled study has provided sufflcient clinical evidence supporting the use of antiviral therapy in the treatment of Bell’s palsy. A Cochrane meta-analysis  involving 246 patients with Bell’s palsy from three separate randomized trials, found the data to be inconclusive and suggested further studies were required to determine the role of antiviral therapy in Bell’s palsy. Several studies [14,16,26,35] published subsequently to the Cochrane review reached similar conclusions and have suggested that antiviral therapy should not be used routinely for treating Bell’s palsy until further evidence is generated from clinical studies . Although the studies of Engstrom et al. and Sullivan et al. demonstrated the beneflts of corticosteroid use (see above), neither study found evidence to support the use of antiviral therapy alone in the treatment of Bell’s palsy. In the study by Sullivan et al. , 124 patients were randomized and treated with combination of acyclovir (2000mg daily for 10 days) and prednisolone (25mg twice daily for 10 days). At 3 months, 79.7% (n=98) of the group showed complete facial function recovery and 92.7% (n=115) demonstrated complete recovery at 9 months (P<0.001) . In comparison, among the patients who received prednisolone alone, 83.0% achieved complete recovery, whereas only 71.2% of those receiving acyclovir alone achieved complete recovery at 3 months. At 9 months, 94.4% in the prednisolone alone increased the chances of complete facial function recovery at 3 and 9 months. Patients in the study were divided into four groups and randomized twice prior to receiving one of the following sets of treatments. Corticosteroids have been recommended as a treatment for Bell’s palsy due to their effects on reducing edema, enhancing cranial nerve VII regeneration, and improving motor function [30,31]. Despite the fact that a Cochrane meta-analysis  concluded that there was insufficient evidence supporting the use of corticosteroids in the treatment of Bell’s palsy, the results of six recently completed studies [14,22,26,27–29] following the publication of the review have provided substantial data supporting the use of corticosteroid therapy. (4) prednisolone (60 mg/day) or 10 days and valacyclovir (3000 mg/day) for 7 days. group (P < 0.003), and 62% (n = 127) of the placebo/placebo group. (2) prednisolone (60 mg daily for 5 days with a 5-day taper) and valacyclovir (1000 mg/day) for 5 days (n = 114). At 6 months, 89.7% (n = 96) of patients in the prednisolone/placebo group achieved complete facial function recovery in comparison with 96.5% (n = 110) of those in the prednisolone/valacyclovir group (P < 0.05) . On average, the patients in this study had more severe facial palsy (HBS 4–5) than those included in the Sullivan et al. study (mean HBS score 3.6). This difference has been speculated to be the reason for the apparent effectiveness of prednisolone with valacyclovir in the Hato et al. study and not the Sullivan et al. study . (2) prednisolone (20 mg three times daily for 5 days with a 5-day taper) and valacyclovir (1000 mg/day) for 5 days. Of the 66 patients in the prednisolone alone group, the mean time for complete recovery was 70.7 days as compared with 76.4 days in the prednisolone/valacyclovir group (n = 84). This difference did not achieve statistical significance (P = 0.977). The study found a statistically significant difference in the cumulative recovery rate based on the initial examination severity of Bell’s palsy. (2) prednisone (1 mg/kg body weight for 4 days with an 8-day taper) and famcyclovir (750 mg/day) for 7 days (n = 50). Three months after initiation of therapy, 12% (n = 8) of the prednisone alone group exhibited at least a four-grade HBS improvement as compared with 28% (n = 14) of prednisone/famcyclovir group (P = 0.028). Interestingly, herpes simplex virus-1 (HSV-1) antibody status was not found to correlate with recovery of facial function . (2) acyclovir (2400 mg/day) for 5 days and 1 mg/kg/day of prednisone (maximum of 80 mg/day) for 4 days followed by a 6-day taper (n = 47). At 6 months, 85.1% (n = 40) of the prednisolone group demonstrated complete recovery as compared with 93.1% (n = 41) of the acyclovir/prednisone group . The results were not statistically significant. Current evidence suggests that the underlying cause of most cases of Bell’s palsy is due to HSV-1 and thus the rationale for using antiviral therapy [32–34]. To date, no controlled study has provided sufficient clinical evidence supporting the use of antiviral therapy in the treatment of Bell’s palsy. A Cochrane meta-analysis  involving 246 patients with Bell’s palsy from three separate randomized trials, found the data to be inconclusive and suggested further studies were required to determine the role of antiviral therapy in Bell’s palsy. Several studies [14,16,26,35] published subsequently to the Cochrane review reached similar conclusions and have suggested that antiviral therapy should not be used routinely for treating Bell’s palsy until further evidence is generated from clinical studies . Although the studies of Engstrom et al. and Sullivan et al. demonstrated the benefits of corticosteroid use (see above), neither study found evidence to support the use of antiviral therapy alone in the treatment of Bell’s palsy. In the study by Sullivan et al. , 124 patients were randomized and treated with combination of acyclovir (2000 mg daily for 10 days) and prednisolone (25 mg twice daily for 10 days). At 3 months, 79.7% (n = 98) of the group showed complete facial function recovery and 92.7% (n = 115) demonstrated complete recovery at 9 months (P < 0.001) . In comparison, among the patients who received prednisolone alone, 83.0% achieved complete recovery, whereas only 71.2% of those receiving acyclovir alone achieved complete recovery at 3 months. At 9 months, 94.4% in the prednisolone alone group achieved complete recovery and 85.4% in the acyclovir group. The study found no evidence to support the use of acyclovir in combination with prednisolone compared with prednisolone alone . Among the 206 patients who received prednisolone and valacyclovir in the study by Engstrom et al. , 72.0% (n = 149) achieved complete facial function recovery at 6 months as compared with 71% (n = 150) of the prednisolone/placebo group and 58% (n = 120) of the valacyclovir/placebo group. Therefore, there was no benefit of combination therapy compared with corticosteroid treatment alone in the study. the 35 patients with severe Bell’s palsy were treated with combination of famcyclovir and prednisone, whereas the remaining 17 patients with severe Bell’s palsy were treated with prednisone only. Seventy-two percent (n = 13) of the combination therapy achieved normal functioning, whereas only 47% (n = 8) of the prednisone-only group recovered completely . The multicenter, randomized, placebo-controlled study by Hato et al. involving 221 patients found that the combination of antiviral and corticosteroid therapy could provide added benefit in severe cases of Bell’s palsy. One hundred fourteen patients who received 1000 mg daily of valacyclovir for 5 days and 60 mg/day of prednisolone for 5 days (with a 5-day taper) were compared with 107 patients who received prednisolone only (60 mg/day of prednisolone for 5 days with a 5-day taper) . Among the patients with an initial complete or severe cranial nerve VII palsy who received the combination of valacyclovir and prednisolone, 95.7% (n = 92) experienced complete recovery within 6 months as compared with 86.6% (n = 82) who received prednisolone alone (P < 0.05). Some experts have questioned the validity of the findings published by Minnerop et al. and Hato et al. , suggesting that the high dropout rate and unblinded design of the trials may have yielded flawed and biased results . Furthermore, in a recent randomized, controlled study involving 150 Bell’s palsy patients, Kawaguchi et al. found no significant difference in the rates of complete facial function recovery between patients receiving corticosteroid therapy alone and those receiving combination therapy. In the double-blinded, randomized prospective trial by Yeo et al. , 44 patients were randomized to prednisone and acyclovir and 47 patients to prednisone alone. At 6 months, 85.1% (n = 40) of the prednisone alone group demonstrated complete facial function recovery as compared with 93.1% (n = 41) of the acyclovir and prednisone group. However, the difference in recovery rates between the two groups did not reach statistical significance. 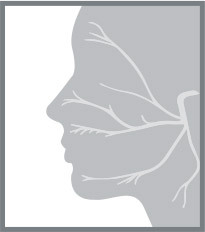 In summary, given the observed benefits outlined in the studies above and the low adverse affects of a relatively short course of treatment, we feel – unless there is a medical contraindication – corticosteroid therapy should be offered in most cases of Bell’s palsy seen within 72 h of the onset of symptoms. In cases of severe Bell’s palsy (HBS Grade 4), the addition of valacyclovir may be warranted , but the evidence behind such a recommendation is not strong at this time . Although isolated case reports have reported the successful treatment of Bell’s palsy with acupuncture [37,38] and physical therapy , the clinical benefit of such treatments remains uncertain [39,40]. A Cochrane review  involving 537 patients with Bell’s palsy who were treated with acupuncture found that the lack of quality studies raised serious questions about the efficacy of such a treatment modality. Botulinum toxin A can be used to reduce the adverse effects of facial synkinesis [2,9]. In cases of acute facial paralysis associated with temporal bone fractures – with electroneurography and electromyography studies indicating the presence of an intact but degenerating nerve – surgical cranial nerve VII decompression may be indicated. The decompression can be performed via a mastoid or middle cranial fossa approach depending on the suspected area of injury [41,42]. Studies [41,42] have demonstrated the efficacy of this approach but recognize that long-term prognosis is improved with earlier intervention. Most neuro-otologists agree that the intervention should be performed within 2 weeks of the acute paralysis [43,44]. Depending on the underlying cause, a number of surgical options exist for preventing or correcting the ocular complications associated with FNP. The following is an overview of the various surgical options that can improve the morbidity associated with FNP. A number of patients with FNP develop incomplete eyelid closure requiring surgical intervention to minimize the risk of corneal exposure and damage. Implantation of a gold weight onto the upper eyelid tarsal plate has been shown to be a highly effective option to protect the cornea in such cases (Fig. 2) . In certain situations, an additional procedure, such as horizontal lid shortening, apart from a gold weight placement may be required . The placement of a gold weight can be associated with postsurgical complications, including astigmatism, pseudoptosis, migration, bulging, and extrusion of the implant . Substituting a flexible platinum chain for the rigid gold weight has been shown to have less postoperative complications . Illustration by David A. Peace, MS, Medical illustrator, Department of Neurological Surgery, University of Florida Brain Institute, USA. Tarsorrhaphy is a reasonable option to consider when preventing and treating corneal exposure. A principle disadvantage of the procedure is the poor cosmetic appearance and compromised peripheral vision (Fig. 3) . The advantages of a tarsorrhaphy include its multiple surgical technical variations allowing customization of the procedure to the individual patient (i.e. medial or lateral tarsorrhaphy), a swift and simple surgical technique and relative ease of reversing the procedure . Facial nerve grafting is indicated in the situation of partial resection of cranial nerve VII due to trauma or tumor. Both the proximal and distal portions of the nerve must be accessible to the surgeon for the procedure to be done. Typically, a tension-free closure under microscopic magnification is necessary to assure a high rate of success. The great auricular and sural nerves are the most common sources for the graft . Interposition nerve grafting typically optimizes facial functioning more than other medical or rehabilitative methods . Patients who undergo successful neurorrhaphy or cable nerve grafting will at best achieve a HBS Grade 3. Most patients will have good facial tone with significant synkinesis and poor smile mechanism. Hypoglossal–facial nerve transfer is typically used for patients with complete FNP that is less than 18 months in duration. An intact cranial nerve VII needs to be accessible for this procedure to be performed. The hypoglossal nerve is connected to the facial nerve via a nerve graft or direct anastamosis. Only a partial portion of the hypoglossal nerve is harvested, thereby limiting the risk of hemitongue atrophy . This technique allows reinnervation of the facial muscles in order to give tone to the face with limited volitional facial movement. Most patients will still have significant facial dysfunction due to synkinesis and non-spontaneous movement. Patients with multiple cranial neuropathies are not candidates for this operation . Static suspension or sling of the oral commissure can be successfully employed in individuals with partial or complete FNP . Permanent sutures, acellular dermis, Gore-Tex (W.L. Gore & Associates, Inc., Newark, Delaware, USA), and tensor fascia lata are the most commonly utilized materials for suspending the ptotic oral commissure [52,53]. Static sling can significantly improve oral incompetence and restore facial symmetry at rest. However, this procedure does not provide dynamic reanimation. Static sling is best utilized in patients who are not good candidates for spontaneous or dynamic reanimation . Most patients undergoing this procedure often also benefit from an asymmetric rhytidectomy in order to further improve facial symmetry . Temporalis muscle transfer has been a valuable surgical procedure for patients with complete FNP over the past two decades. Cheney et al. repopularized the procedure in 1995. The technique utilizes the temporalis muscle that is innervated by the trigeminal nerve to help suspend the oral commissure and provide volitional movement of the face. Several modifications of the technique have been reported in the literature [55,56]. Temporalis muscle transfer has been supplanted by more reanimation techniques such as gracilis muscle transfers innervated by contralateral facial nerve grafts . If a permanent lateral tarsorrhaphy is required then eyelid margins can be incised. A medial tarsorrhaphy can also be contemplated if more corneal coverage is required. Illustration by David A. Peace, MS, Medical illustrator, Department of Neurological Surgery, University of Florida Brain Institute, USA. Spontaneous dynamic facial reanimation refers to mimetic emotional smile restoration. 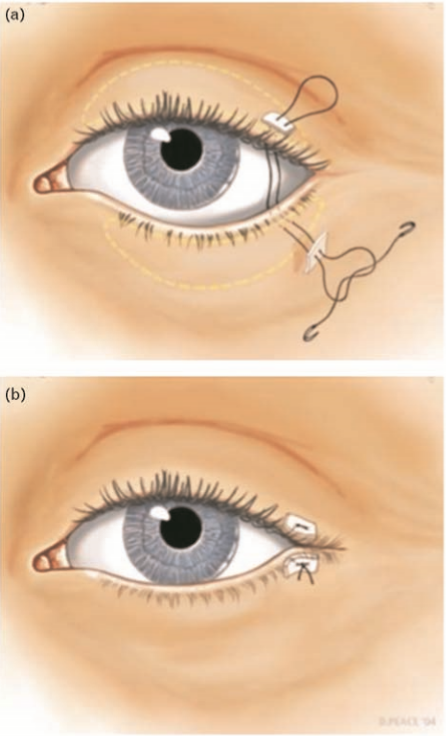 Currently, the most commonly employed method of achieving this goal is by the use of a two-stage operation that utilizes a gracilis-free neuromuscular flap powered by the contralateral facial nerve . In the first stage of the operation, the sural nerve is harvested and coapted to the normal contralateral facial nerve (Figs. 4 and 5) . Typically a branch that innervates the zygomaticus muscle is utilized for reinnervation of the transferred muscle . There is minimal risk of permanent cranial nerve VII injury to the normal side as there is significant arborization of cranial nerve VII in the buccal and zygomatic branches. This ‘cross-facial nerve graft’ requires 8–12 months for appropriate neurotization [58,59]. In the second stage of the operation, a gracilis-free flap is utilized as a muscle source. Pectoralis minor can also be used with good outcome . The cross-face nerve graft is connected to the motor nerve (obturator nerve) of the harvested gracilis muscle. Within 6–12 months, the muscle shows spontaneous movement with appropriate physical therapy. This approach works best in the younger population but is now considered an excellent option for individuals up to 55 years of age [58,59]. Cranial nerve VII palsy is a potentially disfiguring neurologic disorder that can lead to permanent facial muscle paralysis and sensorimotor deficits. Although it is most commonly idiopathic (Bell’s palsy), it may also result from trauma, systemic diseases, or infections. The benefits of early corticosteroid administration in the treatment of Bell’s palsy have been supported by recent clinical trials but the utility of antiviral therapy remains ambiguous. There is a suggestion that the addition of an antiviral agent, such as valacyclovir, to corticosteroid therapy is beneficial in the treatment of severe cases of Bell’s palsy. Two-stage reconstruction utilizing a cross-facial nerve graft followed by gracilis-free flap provides the best option for surgical correction of facial paralysis. Ophthalmologists should be familiar with the current surgical options available to improve or correct cases of nonrecoverable FNP. (a) During the cross-facial nerve graft procedure, a branch of the facial nerve on the nonparalyzed side of the face is isolated, transected and coapted to the harvest sural nerve. This nerve branch has to specifically stimulate the zygomaticus muscle group only. (b and c) The sural nerve is tunneled to the gingivobuccal sulcus after it is coapted to the transected facial nerve graft from the nonparalyzed side. The nerve graft will remain buried in this area for approximately 12 months in order to get neurotized for the subsequent gracilis neuromuscular free flap. (d–f) In the second stage of the procedure, free tissue transfer is performed utilizing the gracilis muscle. The obturator nerve that supplies motor innervation to the muscle is coapted to the cross-facial nerve graft. 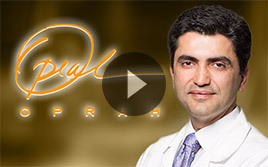 Reproduced by courtesy of Dr Babak Azizzadeh, Division of Head and Neck Surgery, David Geffen School of Medicine at UCLA, USA. Before (a) and after (b) photograph of a female patient who underwent the two-stage procedure with cross-facial nerve graft followed by gracilis neuromuscular free flap. Reproduced by courtesy of Dr Babak Azizzadeh, Division of Head and Neck Surgery, David Geffen School of Medicine at UCLA, USA. The authors would like to thank Sam Salaymeh for his assistance with the figures and tables. 1 Head and neuroanatomy. Thieme Atlas of Anatomy. 1st ed. Schuenke M., Schulte E., Schumacher U., Ross L., editors. New York, New York: Thieme International; 2007. pp. 76–79. 2 Chua CN, Quhill F, Jones E. Treatment of aberrant facial nerve regeneration with botulinum toxin A. Orbit 2004; 23:213–218. 3 Saleh GM, Mavrikakis I, de Sousa JL, et al. Corneal astigmatism with upper eyelid gold weight implantation using the combined high pretarsal and levator flxation technique. Ophthal Plast Reconstr Surg 2007; 23:381–383. 4 Gilden DH. Clinical practice. Bell’s palsy. N Engl J Med 2004; 351:1323– 1331. 5 Brennan PA, Webb R, Kemidi F, et al. Great auricular communication with the marginal mandibular nerve: a previously unreported anatomical variant. Br J Oral Maxillofac Surg 2008; 46:492–493. 6 Coombs CJ, Ek EW, Wu T, et al. Masseteric-facial nerve coaptation: an alternative technique for facial nerve reinnervation. J Plast Reconstr Aesthet Surg 2008 [Epub ahead of print]. 7 Yamamoto E, Nishimura H, Hirono Y. Occurrence of sequelae in Bell’s palsy. Acta Otolaryngol (Stockh) 1988; Suppl 446:93–96. 8 Wright H, Waddington C, Geddes J, et al. 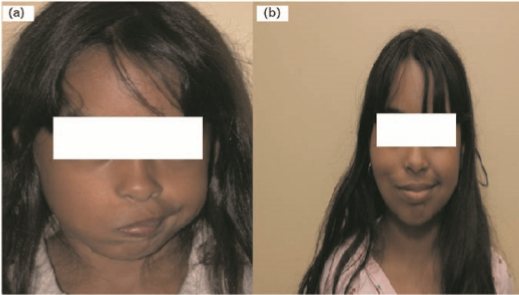 Facial nerve palsy complicating Kawasaki disease. Pediatrics 2008; 122:e783–e785. 9 Montoya FJ, Riddell CE, Caesar R, et al. Treatment of gustatory hyperlacrimation (crocodile tears) with injection of botulinum toxin into the lacrimal gland. Eye 2002; 16:705–709. 10 Devriese PP, Schumacher T, Scheide A, et al. Incidence, prognosis and recovery of Bell’s palsy. A survey of about 1000 patients (1974–1983). Clin Otolaryngol Allied Sci 1990; 15:15–27. 11 Hato N, Murakami S, Gyo K. Steroid and antiviral treatment for Bell’s palsy. Lancet 2008; 371:1818–1820. 12 Rowlands S, Hooper R, Hughes R, et al. The epidemiology and treatment of Bell’s palsy in the UK. Eur J Neurol 2002; 9:63–67. 13 Danner CJ. Facial nerve paralysis. Otolaryngol Clin North Am 2008; 41:619– 632; x. 14 Sullivan FM, Swan IR, Donnan PT, et al. Early treatment with prednisolone or acyclovir in Bell’s palsy. N Engl J Med 2007; 357:1598–1607. 15 Yeo JC, Trotter MI, Wilson F. Bilateral facial nerve palsy associated with HIV seroconversion illness. Postgrad Med J 2008; 84:328–329. 16 Madhok V, Falk G, Fahey T, Sullivan FM. Prescribe prednisolone alone for Bell’s palsy diagnosed within 72h of symptom onset. BMJ 2009; 338:b255. 17 Morris AM, Deeks SL, Hill MD, et al. Annualized incidence and spectrum of illness from an outbreak investigation of Bell’s palsy. Neuroepidemiology 2002; 21:255–261. 18 Hauser WA, Karnes KE, Annis J, et al. Incidence and prognosis of Bell’s palsy in the population of Rochester. Minnesota Mayo Clin Proc 1971; 46:258– 264. 19 Adour KK, Byl FM, Hilsinger RL, et al. The true nature of Bell’s palsy: analysis of 1,000 consecutive patients. Laryngoscope 1978; 88:787–801. 20 Yanagihara N, Mori H, Kozawa T, et al. Bell’s palsy. Nonrecurrent v recurrent and unilateral v bilateral. Arch Otolaryngol 1984; 110:374–377. 21 Gilden D.Treatment Of Bell’s palsy:the pendulum has swung back to steroids alone. Lancet Neurol 2008; 7:976–977. 22 Minnerop M, Herbst M, Fimmers R, et al. Bell’s palsy: combined treatment of famciclovir and prednisone is superior to prednisone alone. J Neurol 2008; 255:1726–1730. 23 House JW, Brackmann DE. Facial nerve grading system. Otolaryngol Head Neck Surg 1985; 93:146–147. 24 Salinas RA, Alvarez G, Ferreira J. Corticosteroids for Bell’s palsy (idiopathic facial paralysis). Cochrane Database Syst Rev 2004:CD001942. 25 Allen D, Dunn L. Aciclovir or valaciclovir for Bell’s palsy (idiopathic facial paralysis). Cochrane Database Syst Rev 2004:CD001869. 26 Engstrom M, Berg T, Stjernquist-Desatnik A, et al. Prednisolone and valacyclovir in Bell’s palsy: a randomised, double-blind, placebo-controlled, multicentre trial. Lancet Neurol 2008; 7:993–1000. Eight hundred and thirty-nine Bell’s palsy patients between 18 and 75 years of age were treated within 72h of symptom onset.Two hundred and ten patients Received prednisolone and placebo, 207 received valacyclovir and placebo, 206 received prednisolone and valacyclovir, and 206 received double placebo. The study found that patients receiving prednisolone alone achieved signiflcantly shorter time to full recovery when compared with those receiving combination therapy. At 6 months, full recovery was achieved in 71% (n=150) of the prednisolone/placebo group (P<0.003), 58% (n=120) of the valacyclovir/placebo group (P<0.0001), 72% (n=149)of the prednisolone/valacyclovir group(P<0.0001),and 62%(n=127) of the double-placebo group(P<0.0001).Further,the study concluded that using antiviral medications did not provide any beneflt. 28:408–413. 28 Kawaguchi K, Inamura H, Abe Y, et al. Reactivation of herpes simplex virus type 1 and varicella-zoster virus and therapeutic effects of combination therapy with prednisolone and valacyclovir in patients with Bell’s palsy. Laryngoscope 2007; 117:147–156. 29 Yeo SG, Lee YC, Park DC, et al. Acyclovir plus steroid vs steroid alone in the treatment of Bell’s palsy. Am J Otolaryngol 2008; 29:163–166. 30 Rai KK, Shivakumar HR, Sonar MD. Transient facial nerve palsy following bilateral sagittal split ramus osteotomy for setback of the mandible: a review of incidence and management. J Oral Maxillofac Surg 2008; 66:373–378. 31 Bracken MB, Shepard MJ, Collins WF, et al. A randomized, controlled trial of methylprednisolone or naloxone in the treatment of acute spinal-cord injury. Results of the Second National Acute Spinal Cord Injury Study. N Engl J Med 1990; 322:1405–1411. 32 Gilden DH, Tyler KL. Bell’s palsy: is glucocorticoid treatment enough? N Engl J Med 2007; 357:1653–1655. 33 Cope D, Bova R. Steroids in otolaryngology. Laryngoscope 2008; 118: 1556–1560. 34 Murakami S, Mizobuchi M, Nakashiro Y, et al. Bell palsy and herpes simplex virus: identiflcation of viral DNA in endoneurial fluid and muscle. Ann Intern Med 1996; 124:27–30. 35 Tyler KL. Prednisolone – but not antiviral drugs – improves outcome in patients with Bell’s palsy. Nat Clin Pract Neurol 2009; 5:74–75. 36 Davenport RJ, Sullivan F, Smith B, et al. Treatment for Bell’s palsy. Lancet 2008; 372:1219–1220; author reply 1220–1221. 37 Rosted P, Woolley DR. Bell’s Palsy following acupuncture treatment: a case report. Acupunct Med 2007; 25:47–48. 38 Wong CL, Wong VC. Effect of acupuncture in a patient with 7-year-history of Bell’s palsy. J Altern Complement Med 2008; 14:847–853. 39 Teixeira LJ, Soares BG, Vieira VP, et al. Physical therapy for Bell’s palsy (idiopathic facial paralysis). Cochrane Database Syst Rev 2008:CD006283. 40 He L, Zhou MK, Zhou D, et al. Acupuncture for Bell’s palsy. Cochrane Database Syst Rev 2007:CD002914. 41 Salami A, Dellepiane M, Mora R. A novel approach to facial nerve decompression: use of Piezosurgery. Acta Otolaryngol 2008; 128:530–533. 42 Quaranta N, Cassano M, Quaranta A. Facial paralysis associated with cholesteatoma: a review of 13 cases. Otol Neurotol 2007; 28:405–407. 43 Sanus GZ, Tanriverdi T, Tanriover N, et al. Hearing preserved traumatic delayed facial nerve paralysis without temporal bone fracture: neurosurgical perspective and experience in the management of 25 cases. Surg Neurol 2009; 71:304–310; discussion 310. 44 Mehta RP. Surgical treatment of facial paralysis. Clin Exp Otorhinolaryngol 2009; 2:1–5. 45 Razfar A, Aflfl AM, Manders EK, et al. Ocular outcomes after gold weight placement and facial nerve resection. Otolaryngol Head Neck Surg 2009; 140:82–85. 46 Berghaus A, Neumann K, Schrom T. The platinum chain: a new upper-lid implant for facial palsy. Arch Facial Plast Surg 2003; 5:166–170. 47 Schrom T, Buchal A, Ganswindt S, Knippping S. Patient satisfaction after lid loading in facial palsy. Eur Arch Otorhinolaryngol 2009 [Epub ahead of print]. 48 Bergeron CM, Moe KS. 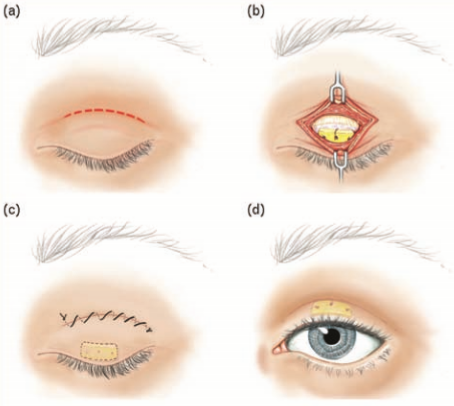 The evaluation and treatment of upper eyelid paralysis. Facial Plast Surg 2008; 24:220–230. 49 Morris LG, Palu RN, DeLacure MD. Modifled tarsorrhaphy for management of the eye in facial nerve palsy. Laryngoscope 2006; 116:1293–1295. 50 Humphrey CD, Kriet JD. Nerve repair and cable grafting for facial paralysis. Facial Plast Surg 2008; 24:170–176. 51 Yoleri L, Songur E, Mavioglu H, et al. Cross-facial nerve grafting as an adjunct to hypoglossal-facial nerve crossover in reanimation of early facial paralysis: clinical and electrophysiological evaluation. Ann Plast Surg 2001; 46:301– 307. 52 Alam D. Rehabilitation of long-standing facial nerve paralysis with percutaneous suture-based slings. Arch Facial Plast Surg 2007; 9:205–209. 53 Ozaki M, Takushima A, Momosawa A, et al. Temporary suspension of acute facial paralysis using the S-S Cable Suture (Medical U&A, Tokyo, Japan). Ann Plast Surg 2008; 61:61–67. 54 Cheney ML, McKenna MJ, Megerian CA, et al. Early temporalis muscle transposition for the management of facial paralysis. Laryngoscope 1995; 105:993–1000. 55 Labbe ´ D, Huault M. Lengthening temporalis myoplasty and lip reanimation. Plast Reconstr Surg 2000; 105:1289–1297; discussion 1298. 56 Byrne PJ, Kim M, Boahene K, et al. Temporalis tendon transfer as part of a comprehensive approach to facial reanimation. Arch Facial Plast Surg 2007; 9:234–241. 57 RodrıguezLorenzo A,MorleyS,PayneAP,etal. Anatomy Of The motor nerve to the gracilis muscle and its implications in a one-stage microneurovascular gracilis transfer for facial reanimation. J Plast Reconstr Aesthet Surg 2008 [Epub ahead of print]. 58 Terzis JK, Olivares FS. Long-term outcomes of free muscle transfer for smile restoration in adults. Plast Reconstr Surg 2009; 123:877–888. 59 Harii K, Asato H, Yoshimura K, et al. One-stage transfer of the latissimus dorsi muscle for reanimation of a paralyzed face: a new alternative. Plast Reconstr Surg 1998; 102:941–951. 60 Terzis JK, Noah ME. Analysis of 100 cases of free-muscle transplantation for facial paralysis. Plast Reconstr Surg 1997; 99:1905–1921.